It's ok that make a shell with 3D printer? Wow. I don't know but that's a great idea. My husband wants to know what software would you use. Yes, but use ABS - PLA can dissolve due to it being corn based, and in a high moister environment, you want it to last (reef forums are a great read for this). Remember to also include natural shells as well, since the crabs may not take it the printed shells! Not for hermit crabs, no. If calcium carbonate shells that were as hard as the snail shells they currently wear could be 3D printed, then perhaps. There was a campaign several years ago that used Ecuadorian hermit crabs and scanned the natural modified shells that they prefer to wear, and those crabs did actually take and wear the 3D printed ones over natural ones. However, it's been the only case I've seen where that has happened. For species that use intact shells, nothing comes close to the real thing - so far. I think it would be wonderful to experiment with if you have the time and ability! 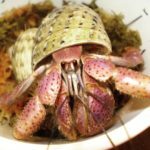 wodesorel wrote: There was a campaign several years ago that used Ecuadorian hermit crabs and scanned the natural modified shells that they prefer to wear, and those crabs did actually take and wear the 3D printed ones over natural ones. However, it's been the only case I've seen where that has happened. For species that use intact shells, nothing comes close to the real thing - so far. I think it would be wonderful to experiment with if you have the time and ability! I know one company did it with potato starch, is that the same project?